New Crochet Pattern Coming and Lots of Crochet on the Hook!!!!! What a busy week… I tested a really great pattern for a fellow Crochet-a-holic, Carolyn from The Purple Poncho… It is soooooo cute… I will post the pictures when she releases it! One of my favorites so far!!! 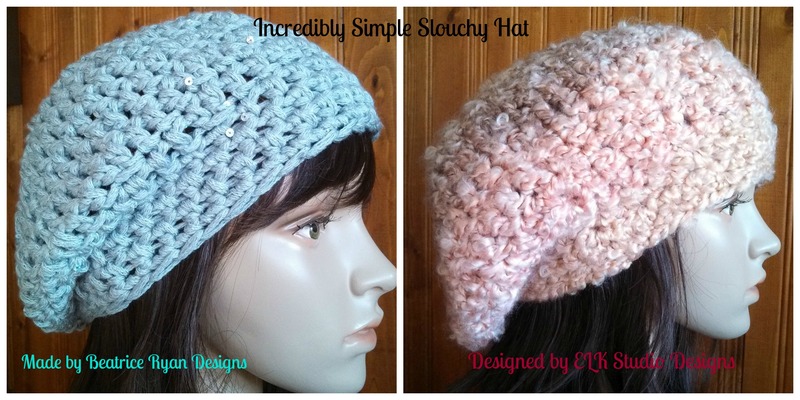 I made two more Slouchy Hats designed by my really good fried Kathy over at ELK Studio Handcrafted Crochet Designs… Incredibly Simple Slouchy Hat! I love this too… It was incredibly easy to work up,,, I made two in one evening!!! Love these Hats…The gray one is made using Bernat Sequins,,, The pinkish one is made using Lion Brand Homespun… Same hook,,, Different results!!!! I will post a picture when its done….. Thanks to all of you who voted… We have a new Fan Choice Amazing Grace Free Crochet Pattern on the way… Amazing Grace Snoodie… I bought some fallish yarn to make this one… I think I may keep it for myself… Snow is coming soon!!! So here is to Slouchy Hats,,, Crochet Friends,,, New Patterns and Fan Votes!! !